People are eating more greens and grains and feeling virtuous about the abundant vitamins and minerals and invaluable protein and fiber. Best of all, these foods are utterly delicious. 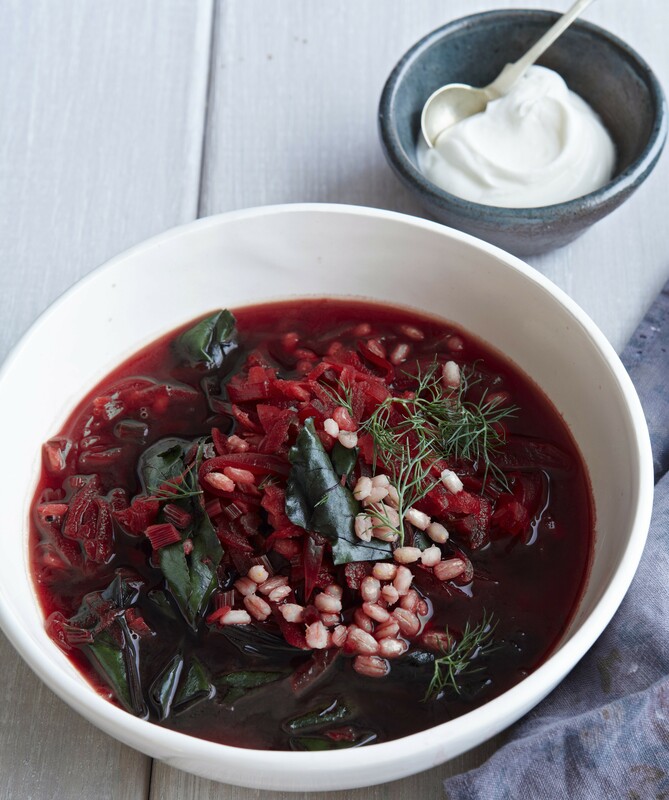 Beet Grains and Barley Borscht from Greens + Grains: Recipes for Deliciously Healthful Meals . The 45 creative recipes in Molly Watson’s Greens + Grains: Recipes for Deliciously Healthful Meals combine greens and grains in dishes for all meal occasions that burst with flavor, color, and lusciousness. These flexible recipes not only make weeknight dinners, many requiring only one pot, but also provide a comprehensive reference of cooking methods for dozens of grains, from quinoa to rye berries. More than 30 mouthwatering photographs convey the beauty of grains and hot greens such as kale, nettles, and collards. This is an indispensable book for the health-conscious home cook. Reprinted with permission from Greens + Grains: Recipes for Deliciously Healthful Meals by Molly Watson, ©2015. (Photos by Joseph De Leo.) Please support your local bookshop or purchase through our affiliate links with IndieBound and Amazon. 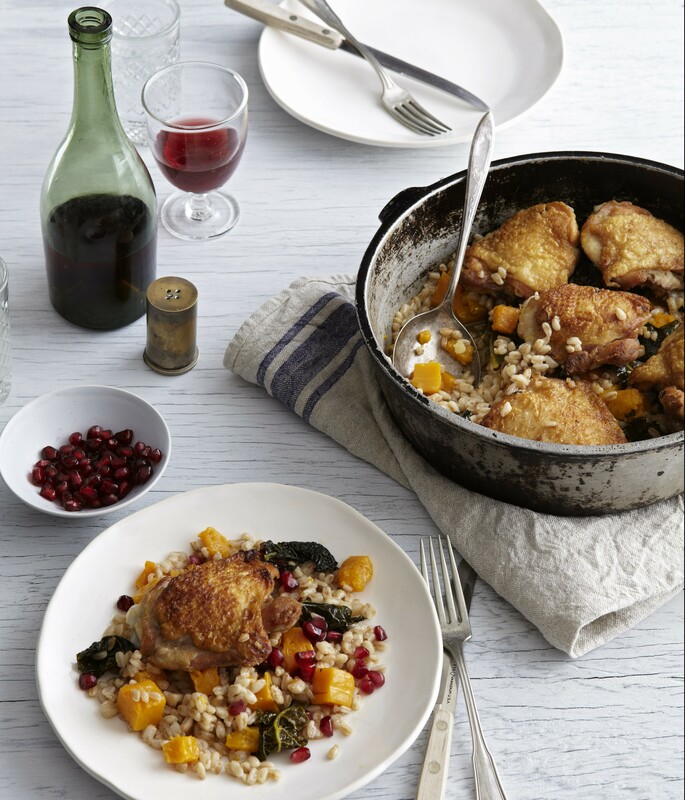 Braised Chicken with Farro, Kale, and Winter Squash from Greens + Grains: Recipes for Deliciously Healthful Meals . This dinner is the culinary equivalent of a giant cashmere blanket. Cozy and comforting, and so easy you don’t really need to think about it, yet oddly rich and fabulous. One pot equals a complete dinner, although a crispy tossed green salad with a sharp, acidic dressing on the side wouldn’t be out of order. Start off with a pan or pot at least 12 in/30.5 cm across. The heavier the better; cast iron is ideal. Heat it over medium-high heat, add the vegetable oil, and swirl to coat the bottom of the pan. Set the chicken, skin-side down, in the pan and cook, undisturbed, until the skin has rendered off much of its fat and become beautifully, deeply browned, 4 to 5 minutes. Transfer the chicken to a plate or platter. Do not clean the pan; just pour out any excess fat, leaving a thin coat in the pan, and return it to the stove. Add the shallots and salt, and cook, stirring frequently, until softened, about 2 minutes. Add the sherry and cook, stirring and scraping up the browned bits from the chicken, until the sherry is pretty much evaporated. Add the squash and stir so it’s coated. Stir in the kale and cook, stirring frequently, until wilted and just a bit tender, about 3 minutes. Add the farro and stir to combine. Add the chicken broth, bring to a simmer, and set the chicken pieces, skin-side up, on top of the farro and vegetables. Cover and simmer until the farro and vegetables are tender, the liquid is absorbed, and the chicken is cooked through, about 30 minutes. Preheat the broiler, uncover the pan, and set it under the broiler to crisp up the chicken skin, rotating the pan as necessary. Serve all together. Garnish with pomegranate seeds, if you like. 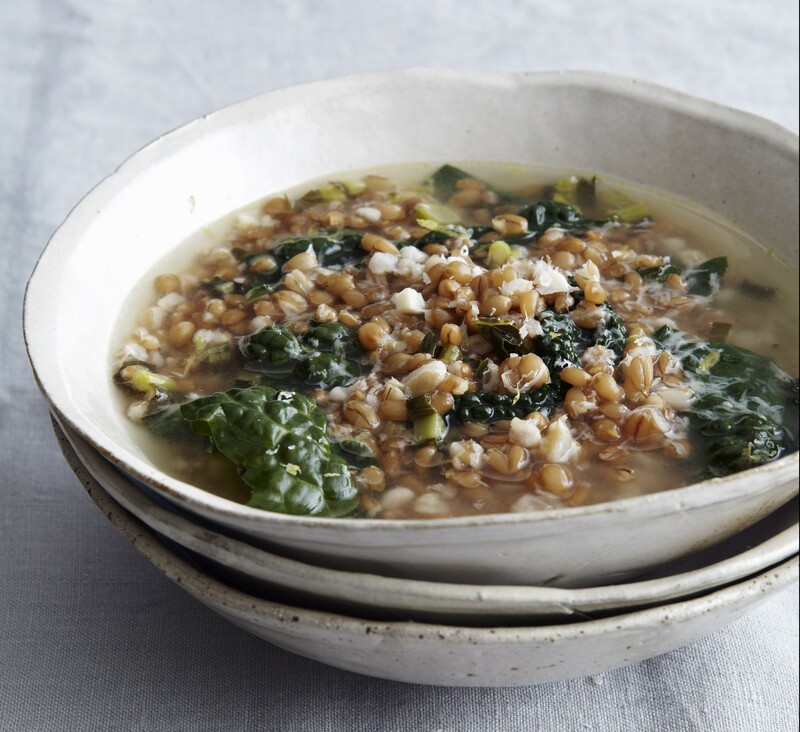 Basic Greens and Grains Soup from Greens + Grains: Recipes for Deliciously Healthful Meals . This basic recipe sets the stage for all kinds of experimentation. The combination of barley or farro and chard is a particular favorite at my house, where we almost always add the optional beans and chili powder (see Variations, following). Seriously, any green you can cook works in this recipe, which is more template than formula; just adjust the total cooking time. I like to cook the grains separately so the broth doesn’t get starchy, but feel free to cook the grains in the soup—just add an extra 1 to 2 cups/240 to 480 ml water and cook until they’re just tender to the bite before adding the greens. If you want to use quinoa or bulgur or another quicker-cooking grain, add it at the end along with the greens. Rinse the grains. Put the grains and 2 tsp salt in a medium pot and cover generously with water. Bring to a boil, lower the heat to maintain a steady simmer, and cook until the grains are tender to the bite; the exact amount of time will depend on the grain used, from 15 minutes for quinoa to up to 60 minutes for rye kernels. Drain and set aside. If using greens with thick stems, like chard or kale, cut the stems out from the leaves. Trim the stems and finely chop them, then cut the leaves into thin ribbons; keep the stems and leaves separate. If using greens without thick stems, simply chop the leaves into ribbons or bite-size pieces. Heat 1 tbsp of the olive oil in a soup pot over medium-high heat. Add the stems and cook, stirring frequently, until they’re soft, about 5 minutes. Add the garlic and stir to combine. Add the chicken broth and cooked grains and bring just to a boil. Add the greens, stir to combine, and cook until wilted and tender, just 1 or 2 minutes for spinach, 5 minutes for chard, and up to 10 minutes for hearty kale. Season with salt. Serve warm with a grind or two of pepper. Leftovers will keep, covered and chilled, for 2 or 3 days. This soup also freezes nicely for up to 6 months. Add 2 cups/430 g or one 14-to-15-oz/400-to-430-g can cooked beans such as white beans, chickpeas, or cranberry beans with the cooked grains. Drop a Parmesan cheese rind into the broth while the greens simmer, and garnish with freshly grated Parmesan cheese. Use chopped onion, chopped celery, and chopped carrot with or in place of the greens’ stems. Spice things up with 1 tsp ancho chile powder or 1/2 tsp red chile flakes with the garlic. Squeeze in the juice of 1 lemon at the end and/or a bit of grated lemon zest. On Wednesday, January 14 from 6:30 to 7:30 pm, Molly Watson discusses and signs copies of Greens + Grains at Omnivore Books on Food, 3885a Cesar Chavez, SF. 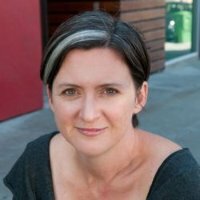 Molly Watson is a San Francisco-based food editor and writer. This entry was posted in Eat and tagged grains, greens, Molly Watson, recipes. Bookmark the permalink. ← Win Prizes, Get Free Movies from Fandor and Help Us Improve EatDrinkFilms.com!